I’ve been listening to Bon Iver on repeat, and the lyrics from Holocene have been haunting me. If you know the song, you may know what I mean. This summer has been full of all kinds of highs and lows for me as well as some of my close friends. But summer has come to an end, and fall always fills me with anticipation. For some people, autumn is like a slow lead up to the winter doldrums. But for me, the smell of decaying leaves reminds me of high school cross county, fall marathons, and chilly football games at JMU. Anyway… To get to the point, I found out that the song is really a metaphor for when you’re not doing well. And the front man for Bon Iver stated in an interview that it’s also “a song about redemption and realizing you’re worth something; that you’re special and not special at the same time”. I love that. I’ve had some moments in the past few months where I’ve kind of felt a bit lost… if it weren’t for my running teammates I would have probably taken an extended break from running. But I’ve reached this point where I think I feel like I’m helping my clients (who are mostly my friends) reach their goals and I really feel fulfilled. So I’m not going to stress about the fact that I haven’t had a good race in months. It will come with time, and I just have to be patient. I think my perfectionist 22 year old self would be impressed with the more relaxed 32 year old version of me. I was planning to train for shorter races this year, but I’ve become really bored with 5ks. Then I remembered that I qualified for Boston last fall with my 3:05 at Mohawk Hudson. I checked it out, and registration opens on September 10th which is in two days! Holy crap, good thing I checked. That gives me some time to build a base before starting marathon specific stuff in January, and an excuse to see my family for a few days. And redemption, indeed. 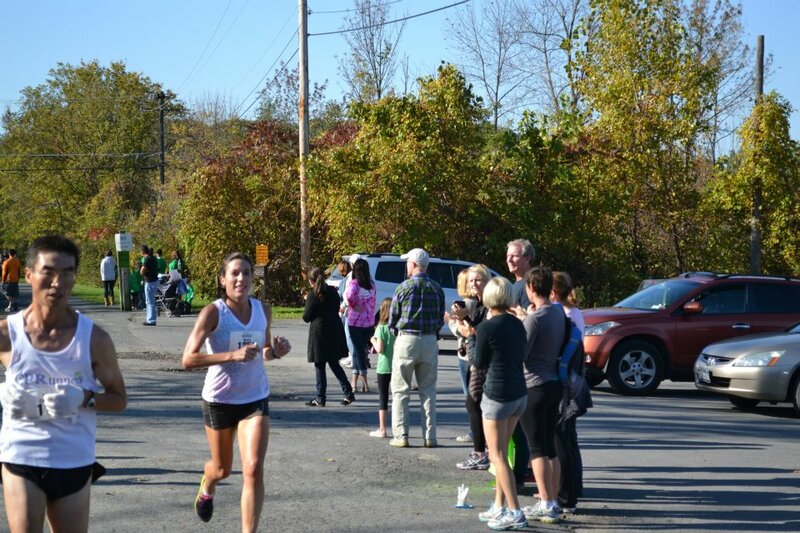 Running my Boston qualifier last fall, all smiles because I’m about to pass this guy. Love Bon Iver! 🙂 Great post… Autumn is *one* of my favorite season!